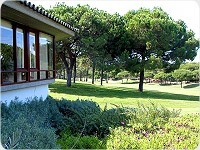 A notable course that has been selected several times as the location for what is now known as the "Algarve Open" and previously named the "Portugal Open". 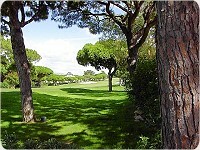 As to be expected this course is designed for the long hitter, requiring the player to pick a selected route around the course in order to make a decent score. The 18 holes are both anti-clockwise loops, the first nine needing a draw on the ball, whilst, the back nine favours a drive that fades from each tee. A water hazard in the form of lakes are to be encountered on holes 3, 15 and 17. Experienced players find that the holes 8,10,15 and 18, are the most testing. Holes 2,3,5,12, 13 and 17, provides the player the best chance of making birdies. Via Infante (A22) - Take Airport Exit-13 and head south past Football Stadium on the right. About 1 km further bear right to Almancil up a small slope just before you reach the flyover which is the Road EN 125. Follow the traffic stream to the west but bear to the right directly after São Lourenço onto a flyover which takes the driver into Almancil. Move to the right hand lane when you see the traffic lights. At the second traffic lights turn to the left and follow the road south (after approx. 300 meters the road divides - take the right hand fork). Drive south to a T-Junction. 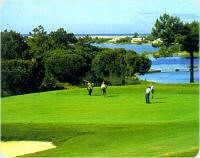 Turn left to Quinta do Lago Area Courses. 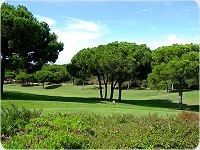 After passing the Shopping centres on the right side there is a roundabout - here you take the turning into the main Quinta do Lago Resort and on the fourth roundabout you turn right to the course.